Members from Boa Mistura, a seven member art collective from Madrid, Spain, stayed in Akron for one week to create Never Turn Back. People are the key element of a vibrant city. Never Turn Back is a gift for pedestrians to enjoy in public space. The installation’s clever use of symmetry is best appreciated by a person on foot, and the playful nature of the design comes most alive when the passerby interacts with it. The phrase “Never Turn Back” is meant to capture and encourage the persevering spirit of Akron. It is a reference to Akron’s history as a city of innovation as well as inspiration to move forward into the future. The installation is commissioned by Downtown Akron Partnership as part of the High Arts Festival with support from the John S. and James L. Knight Foundation, Peg’s Foundation and Ohio Arts Council. Boa Mistura was recommended to Downtown Akron Partnership by Gehl Studios as part of recommendations for public space improvements in downtown Akron. The team has an unusual technique that creates bold, vibrant works that also encourage interaction with public space and play on perspective, space and language. The team spent time with students from a University of Akron public art class, the Art Bomb Brigade and the public as part of workshops. 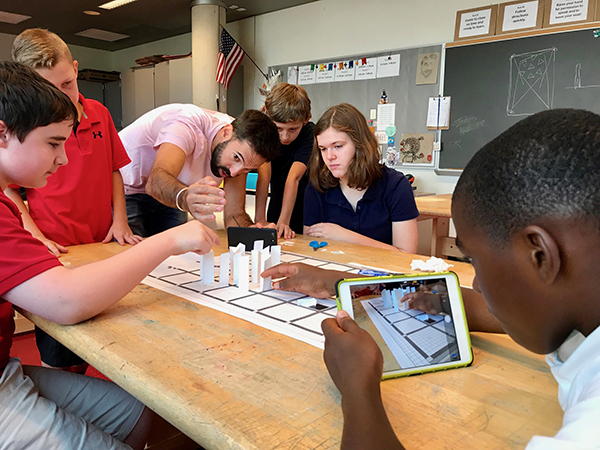 They also worked with 7th graders at the National Inventors Hall of Fame STEM Middle School to begin conceptualizing a large installation on the school’s plaza at the Broadway/University Ave intersection. That intersection plays a critical role in “The Link” – an east/west connection between the University of Akron and downtown, and is a great opportunity to explore an artistic welcome and interactive space with university students, middle school students, downtown employees, church parishioners, visitors and employees, all who use this crossroads as part of their daily routine. That project is slated for spring 2019. The term “Boa Mistura” comes from the Portuguese “good mixture,” which is an appropriate way to describe the diversely talented team of artists that created the installation. Boa Mistura is an art collective that seeks to enliven public spaces with imaginative mural paintings and bold visual designs. The team met as teenagers while painting graffiti art on the walls of their neighborhood in Madrid, Spain. Today, Boa Mistura is an internationally renowned group with projects in South Africa, the United Kingdom, Brazil, Mexico, Georgia, Chile, Algeria, Norway, Kenya, China, Serbia and Panamá. Akron is the second city in the United States in which they created an installation.